For more than 75 years, Modern Litho companies have assisted dozens of non-profit organizations with their membership, fund-raising, and other marketing needs. Never before has there been more of a need to understand what is available for you to use in communicating your messages than now. With the challenges of todays economy, the need for each of us to help our community and our neighbor, and the constant emotional tug to dig deeper into our hearts and our pockets, we are surrounded by charities and organizations asking for our time and our dollars. 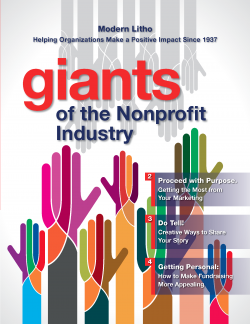 So how do you stand out in a sea of worthy causes? By telling compelling stories, showing the positive results of how gifts have helped your organization, and by reaching out using a combination of touch points. We’ve learned that it takes multiple efforts and multiple channels to elicit the responses you are seeking. At Modern Litho we can provide you with options including digital marketing, print, and direct mail.